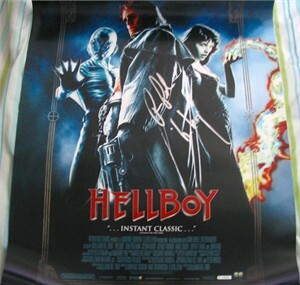 Poster issued to promote the DVD release of Hellboy, autographed in silver by the movie's star Ron Perlman and inscribed Hellboy. Measures about 18 by 26 inches. HAS MINOR TO MODERATE HANDLING FLAWS AND WEAR. Obtained in person at celebrity golf tournament. With certificate of authenticity from AutographsForSale.com. ONLY ONE LEFT.